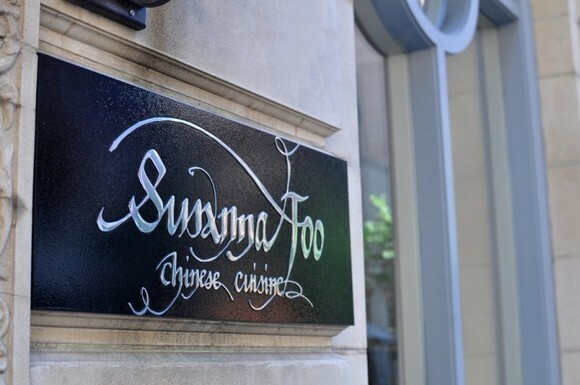 The Astronomer requested we celebrate his 23rd birthday at Susanna Foo because word on the street is that she serves up some mean Cantonese and Shanghai cooking. I was a bit hesitant about The Astronomer’s choice because I have two general rules about dining at ethnic restaurants: Firstly, the price range should be inexpensive to moderate because great ethnic eats can always be found on the cheap. 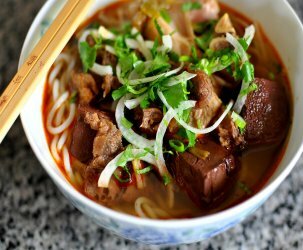 Secondly, the majority of the restaurant’s patrons should be of the ethnic identity of the cuisine because it is a sure sign the food is authentic and not watered down for the masses. Needless to say, Susanna Foo is pricey and serves a non-Chinese clientele. While I would have personally passed on dining there, it was The Astronomer’s birthday, so I put aside my preferences for the evening. We arrived on time for a 7 o’clock reservation and were seated right away at a table large enough for four. The noise level inside the elegantly decorated restaurant was unexpectedly robust, mostly due to happy hour revelers at the bar. I dined at Susanna Foo seven years ago with my mother and brother and sat in the upstairs dining room, which was much quieter. However, on this evening the space appeared to be closed. The crowd in the main dining room seemed to consist mainly of business people and a few couples. The Astronomer began his birthday feast with an order of Mongolian Lamb Pillows stuffed with tarragon, cumin and leeks and served with Chinese eggplant in an Ancho chili sauce. The pillows were tender, but lacked the strong lamb flavor we were hoping for. 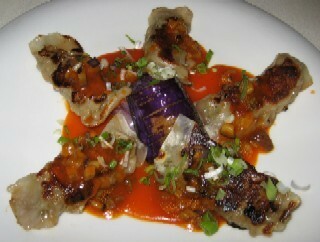 The pillows tasted like good-quality meat in wonton wrappers and not the least bit Mongolian (whatever that means). The eggplant was slightly undercooked, but still appealing. The Ancho chili sauce was sadly tame. I’d take five dumplings for a dollar from Dumpling House any day over these. 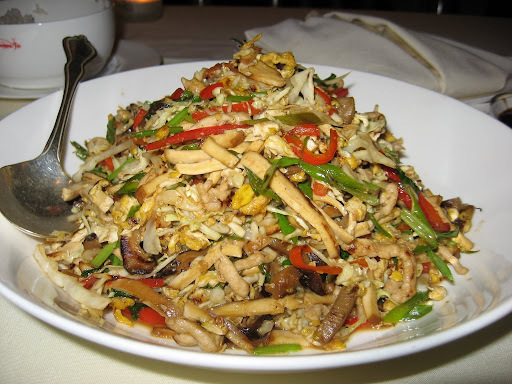 For my appetizer, I ordered the Kung Pao Tofu, which was listed on the “sides” section of the menu. For a side dish, the tofu’s portion was huge and came with two servings of white rice. 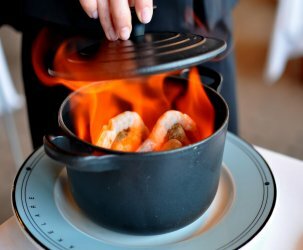 I was really impressed by this dish. 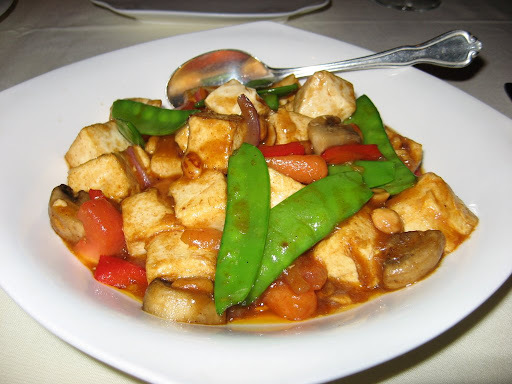 The Kung Pao sauce was perfectly spicy and not too peanut-y, the tofu was lightly browned and firm, and the variety of vegetables were impressive. Although we probably shouldn’t have eaten the entire plate, it was so good we couldn’t help ourselves. 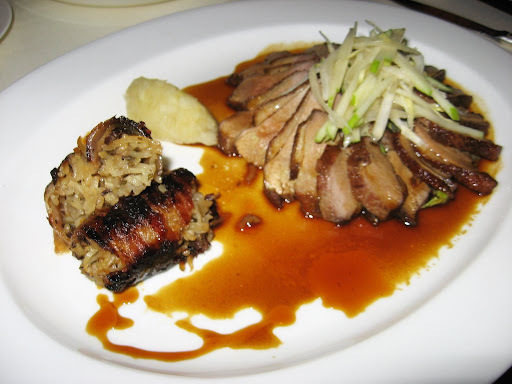 For The Astronomer’s main course, he had the Tea-Smoked Peking Duck Breast served with Fuji apple chutney, braised fingerling potatoes, and sautéed Chinese vegetables. The Astronomer thought that the duck breast was well-seasoned and flavorful, but not as succulent and juicy as he wished. The sides were decent, but definitely nothing spectacular. The apple chutney was not very chutney-like and resembled more of a thick and colorless puree. 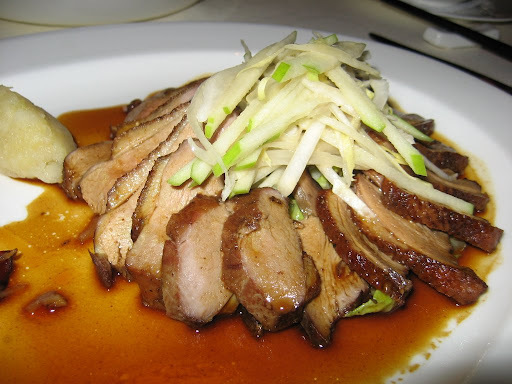 The Astronomer detested the Chinese vegetables underneath the duck due to its bitterness, but liked the fresh apple slaw atop the duck. For my entrée, I ordered the Classic Mu-shu Pork served with a Brandy Hoisin sauce and steamed pancakes. Mu-shu pork is one of my all-time favorite Chinese treats for its unique flavor combinations and fun assembly process. Susanna’s high-end interpretation of Mu-shu was fantastic. 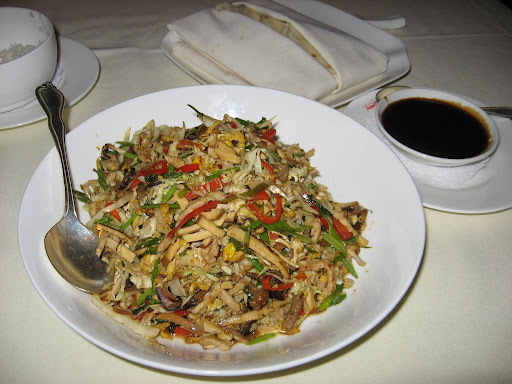 The meat mixture was an interesting blend of pork, bean curd, mushrooms, red peppers, and scallions. The Brandy’s essence came through nicely in the hoisin sauce. The pancakes were abnormally thick, resembled miniature tortillas, and held the contents well. 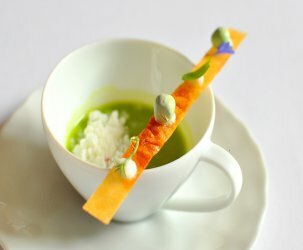 All three components gelled together perfectly for a delectable wrap. As per usual with Mu-shu, there were too few pancakes for the heaping portion of pork. Susanna’s Mu-shu was better than average, but for $18, it really ought to be. 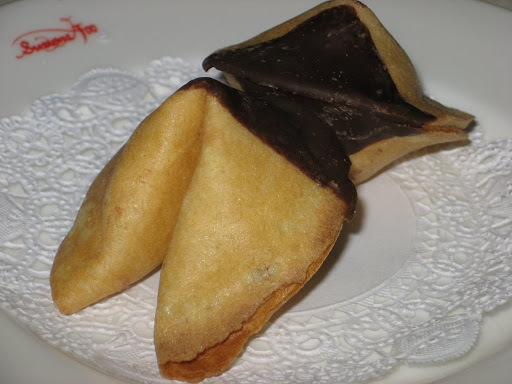 We concluded our celebration with some chocolate dipped fortune cookies. I really enjoyed all of the dishes I sampled this evening, but at the end of the meal, I still believe that my personal policies regarding dining at ethnic restaurants hold true.